Sooo.. we have now had a few people ask us what exactly a port is and what it’s there for so we thought you we try and inform people a little! 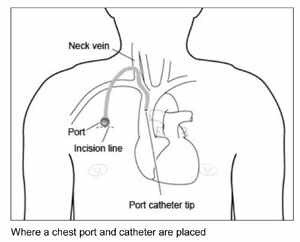 A portacath or a port is used to provide access to veins long term for people who will need bloods and or iv antibiotics and other treatments on a regular basis,It’s an implantable device and sits under the skin on either the chest or under the arm. Although Stanleys is somewhere inbetween it’s wherever they can get it when in theatre really! A port is a thin, soft tube made of plastic. It has an opening just under the skin. This is called the port. The port is a disc which isn’t very big at all.It can be used to give iv antibiotics directly into the vein or to take blood. 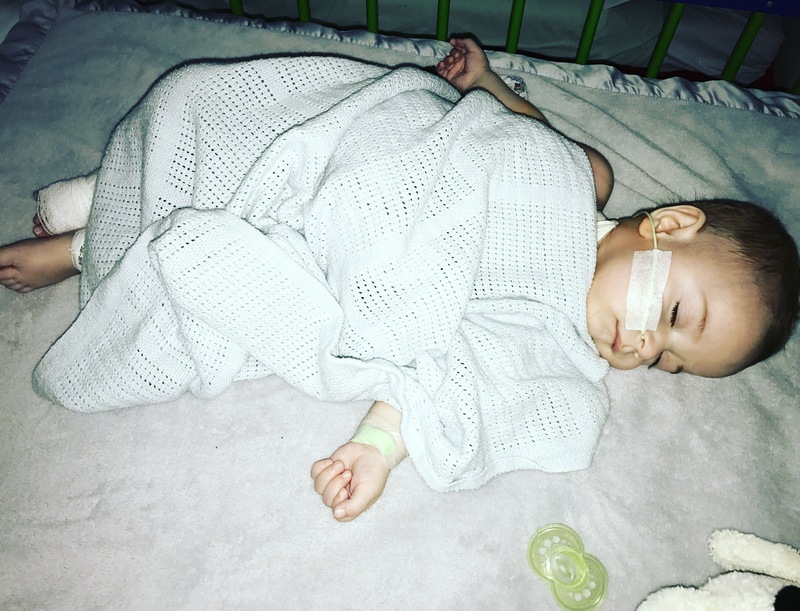 The device is put in by one end of the tube being put into a large vein by making a cut through the neck ( not a big cut Stanley now has just one stitch in his) just above the heart, the other end then connects with the port. this is the part that goes under the skin which when not in use will just look and feel like a lump under the skin, it’s only when in use that the line will actually be connected.. meaning the rest of the time it’s almost like it’s not there unless its in a awkward place that is! 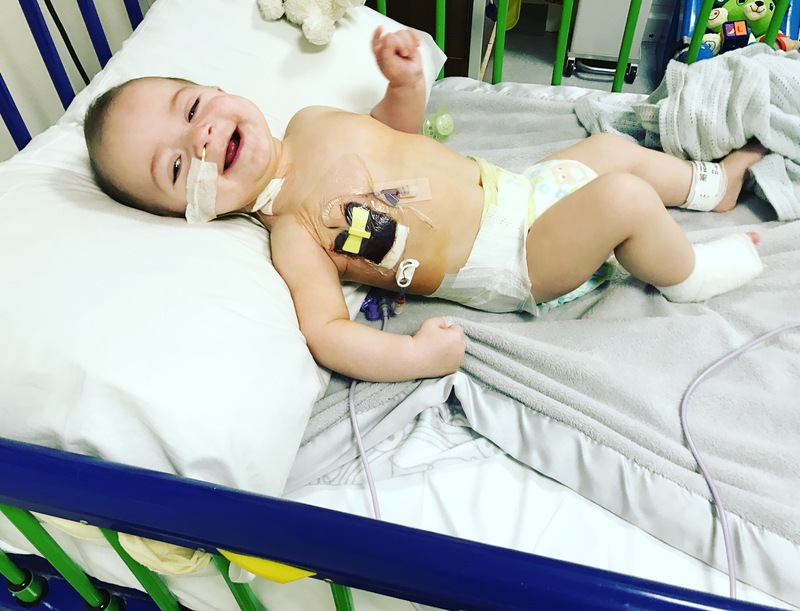 For the children under the care of the CF team within Leicester Stanley is the youngest person with a port in as far as we have been told. Both me and Jack were slightly worried that he was needing to have something like this at such a young age but he has now had six admissions within the last four months, each and every time it’s become virtually impossible for us to either get a line in, that being a cannula or a long line and if the doctors have managed to get one in we were lucky to make them last hours never mind days. 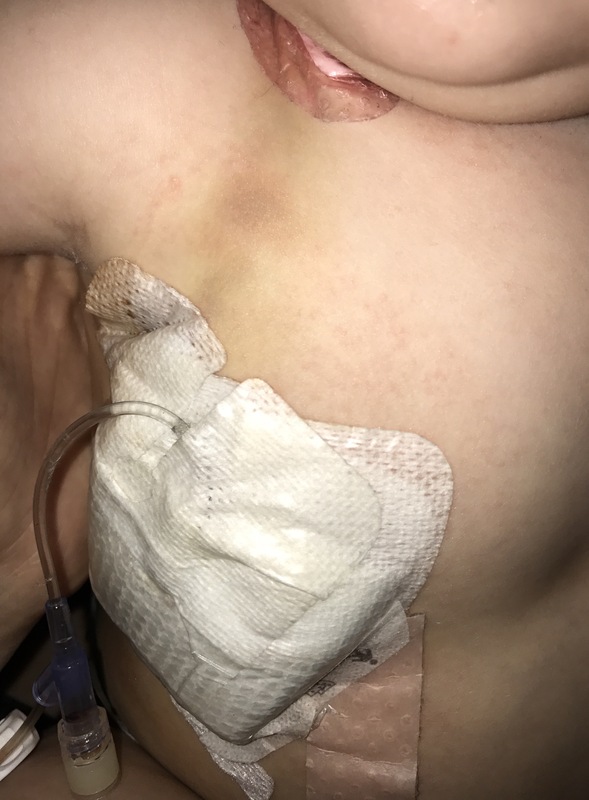 The whole process of trying to get cannulas in isn’t nice for an adult so for a small baby to keep having to go through this several times a day sometimes leading the team to give up and revert back to oral antibiotics when this wouldn’t have necessarily been the chosen treatment was just too much. Having the portacath admittedly isn’t the nicest of things and it’s not something we were massively keen on Stanley having, But when deciding on pros and cons , the pros of him having one made the decision easier. Of course it’s something that is more invasive than a normal line being put in, its surgery so that meant another general anaesthetic, and it will leave a scar, there’s a slight risk of infection also. 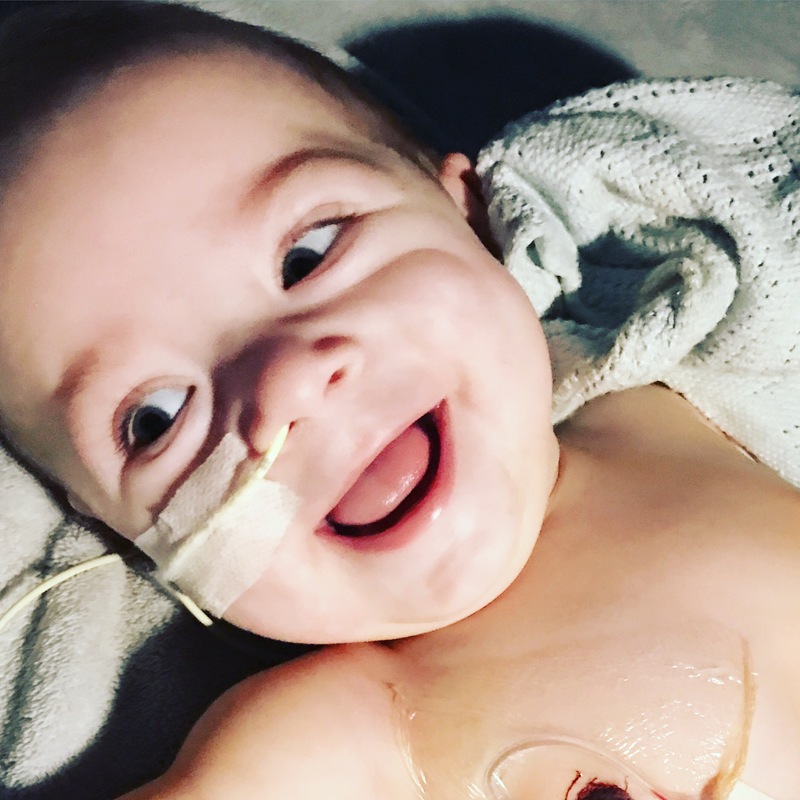 But the fact that we can now easily take blood from it without the need for needles, we can start treatments should he so need them straight away, and it means he always gets to finish the treatment he needs defiantly means for Stanley it was the right decision to make. It wasn’t a question of it being a bad thing it was simply something there to make getting access more of a simple process. Another massive decision maker for us was the fact we can use the port at home, we will be trained to give iv antibiotics through it meaning whilst he’s well and only needing iv antibiotics there will be no more two week stays in hospital – meaning we can be at home with BOTH of our boys, some normality can resume and the iv antibiotics will slot somewhere into our normal daily routine – can we get a hurray for that! We are now 4 days post op and although sometimes showing signs of being slightly sore and bruising from where the line has been inserted Stanley is doing really well he is back to his usual self with lots of smiles for the nurses of course! 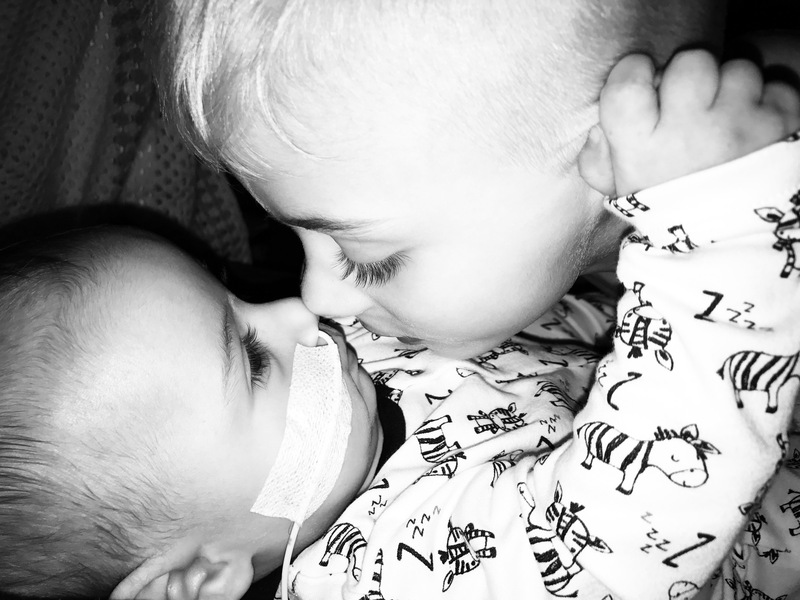 we now hope to be home on Tuesday next week once all of his medications have been ordered to be used at home! Until then we have home leave in between doses of treatment, which we will defiantly take after having done a week in isolation! bruising after surgery where line has been inserted this will go down.